This page is being re-written... A multi-level parking garages will replace the open lot there now, and a major expansion is being constructed into the old parking lots, and will be known as "The Springs". 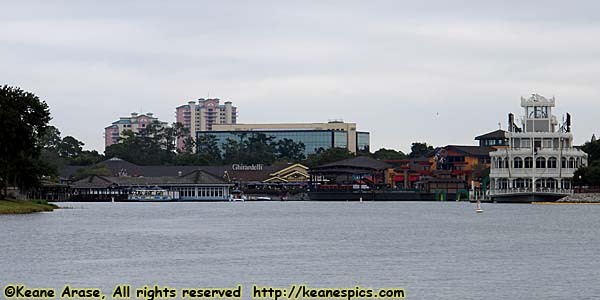 Downtown Disney, Marketplace from an Old Key West (Sassagoula River) shuttle boat. In addition to the theme parks and the resorts, Disney has other venues to part the guests from their vacation dollars. Five golf courses, two miniature golf courses, two water parks and a sports complex. And then there's Downtown Disney, where you really can't get everything Disney, but you can get close. Downtown Disney is where Disney's retail outlets exist. The ones not in the theme parks. And Resorts. And there are several food venues and retail outlets that have probably made a pretty good deal with Disney to share space, from specialty restaurants like Wolfgang Puck's, to Ghirardelli Chocolates, to Lego. I do admit, that a trip to Disneyworld isn't complete without a stop at Downtown Disney. Like the parks and resorts don't provide enough shopping opportunities. On the other hand, Raglan Road might be one of the best restaurants around. Marketplace is the oldest and probably the most Disney-centric of the three areas of Downtown Disney. The World of Disney (the world's largest Disney Store), Art of Disney, Disney's Days of Christmas, Once Upon A Toy, Disney's Pin Traders, Team Disney are all owned and operated by Disney, and are filled with theme park, general Disney stuff, ESPN and other Disney brands. Of course there are other known venues here, such as an Earl of Sandwich, Ghirardelli's Chocolate, Wolfgang Puck's Express, Rainforest Cafe and it's prehistoric alter-ego T-Rex, and a Legoland. Pleasure Island was Disney's Nightclub Area, and is being rebuilt into a new theme called The Springs. Disney's newest area of Downtown Disney is the West Side. 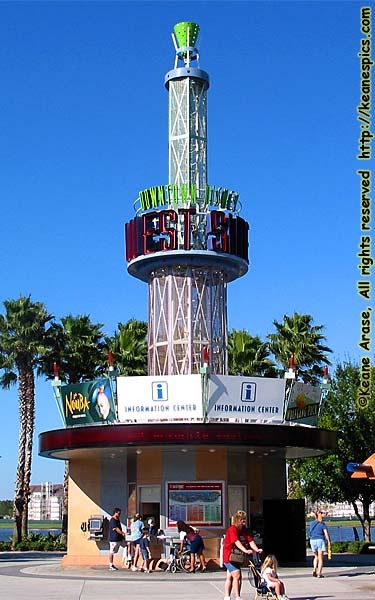 Other than some small stores (and Disney Quest), Disney has left this area to other popular venues such as a 24 screen AMC movie theater, Wolfgang Puck's, a House of Blues, and even a dedicated theater for Cirque du Soleil.